Review Summary: FOX fails to hook your attention. At the box-office despite the presence of star-names the fizz would be missing. FOX fails to hook your attention. At the box-office despite the presence of star-names the fizz would be missing. Making a suspense thriller is tough. Kill your time on it. 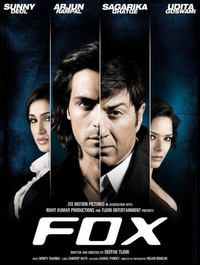 Arjun (Rampal), a successful criminal lawyer develops a conscience. He realises how silly he has been after a few years and gives up the practice altogether. What do you do when you see a fox in a jungle? If only the whodunit factor could have been held on for a little longer "Fox" would have turned out to be as exciting as it seemed in the first half.